As we sat in a traffic jam on the highway leading west out of Portland, Heather read an appropriate passage from our guidebook out loud. "We want you to visit our State of Excitement often. Come again and again," said Oregon's governor, Tom McCall in 1971. "But for heaven's sake, don't move here to live. Or if you have to move in to live, don't tell any of your neighbors where you are going." Judging from the traffic and hustle of this formerly sleepy state in the Pacific Northwest, the secret is out. The corporate home of Nike and Intel has been a business magnet over the past decade, attracting people from across the country and around the world. And yet, it manages to retain its rural charm -- for the most part. We designed it as a quick getaway from Seattle -- a chance to enjoy the fabled Oregon coastline, as well as an opportunity to take advantage of shopping in a state that has no sales tax. With our wedding looming fast, our need to acquire rings forced us to mix business with pleasure. But we were consummate travel companions before we became spouses-to-be, so tourism came first. Rather than make a direct trip to Portland, we made a last minute decision and veered East towards Oregon's other natural tourist attractions -- The Columbia River Gorge. True to our "off the beaten path" approach to travel, we began that trek on the Washington State side rather than on the Oregon one. Actually, truth be told, we turned off too early, but when it comes to travel, we've discovered that serendipity favors the bold as well as the blind..
We almost sped by the Bonneville Lock and Dam, but another fortuitous reading of our guidebook pointed out that June was one of the best months to visit the power station's famous "fish ladder." This maze, found alongside the dam, helps the river's fish pass through the manmade barrier. That way, salmon and other anadromous fish that are spawned in fresh water, can mature in saltwater, and then migrate upstream to spawn. As accommodating as it sounds, environmentalists aren't crazy about the idea because the dam still disrupts the fish' migratory patterns. Indeed, 15% of them don't make it through, and end up getting mulched by the dam's turbines. That's unfortunate for the fish, but human tourists can take advantage of the glass walled bunker below the power station and marvel at their Sisyphean task as they struggle to swim upstream. It's akin to watching a gaggle of humans try to walk the wrong way in a wind tunnel. 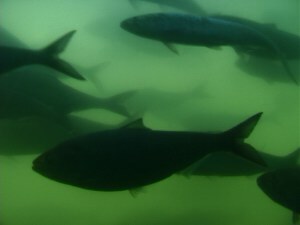 The water is churning fast, as hundreds, maybe thousands of fish almost appear motionless as they maintain zero velocity in their fight away from the ocean. It's an astonishing sight, and it's hard not to admire the fish' instinctive, unrelentless drive to reach their goal. The Bonneville Lock & Dam visit is free, and it only costs 75 cents to cross the nearby Bridge of the Gods over the mighty Columbia into Oregon. Indian legend says that a natural bridge once stood there, hence the pluratheistic name. Today, a steel girder bridge allows passengers (and careful drivers) to take in the panoramic view of the gorge, the river, and the densely forested hills. Once on the other side, we were quite taken with the fact that, except for the Best Western hotel, we were unable to find one franchise establishment That seems to be a rarity these days in America, where it's possible to close your eyes and got lost on any suburban street corner because of the indistinguishable proliferation of fast food chains, gas stations and supermarkets. We decided to reward these die-hard mom and pop businesses with our lunch business and selected the local drive-thru. No Value Meals here, as the counter attendant in this 1950's throwback was forced to tabulate our order using a pencil and paper -- and get this -- mental arithmetic! Our cheeseburger and chicken sandwich were delicious. The freshly-made French fries were copious and didn't leave any grease stains inside the large white paper bag in which they were served. We ate outside and watched over forty school children inundate the drive-thru with their ice cream orders. Grasping a brilliant notion when I see one, I waited for the hordes to subside and then ordered my very own medium, soft-serve chocolate ice cream cone. I should have listened to the schoolteacher who had warned her students to stick to the small portion. The ice cream was almost more than twice the length of my hand, and I nearly managed to consume it all. 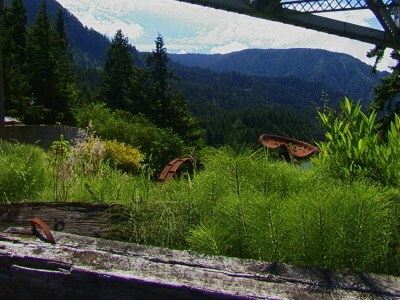 We then tackled one of the oldest highways in the country -- the Columbia River Scenic Highway, or U.S. 30. It was opened to traffic in 1915, and has since been supplanted by the wider, less precarious U.S. 84. But if you want a nice, tree-lined drive as you visit the nine waterfalls as you head west to Portland, this is the way to go. We stopped to take in the Multonomah Falls, which at 620 feet are the highest in the state. I promise to return one day and visit Portland's famed brewhouses, rose gardens and riverwalk, but this time around, it was merely a suburban shopping expedition stop, as we purchased what we were looking for, tax free. Okay, so that accounted for the tank of gas we used to drive down, it was still a liberating feeling to witness the final tally exactly match the products' list price. And it certainly beats Seattle's outrageous 8.8% tax, part of which goes to publicly fund the corporately-monikored stadiums used by its muti-million dollar generating football and baseball teams. I don't like the Mariners or the Seahawks, and I'm certainly not about to contribute to their swanky playing fields. Purchases made, we headed for the hills that we had to traverse before we could reach the coast. A sign warned me that the gas station we had just passed was the last one we would see for forty miles. A quick calculation convinced me that we had more than enough to make it. Ten miles into our uphill climb, and my fuel gauge bottomed out, proving once and for all that a driver shouldn't take chances with a car he doesn't know (it was a rental). We made our way through the sparsely populated, densely wooded hills and I prayed that the second half of the drive would be downhill if I was forced to shift into neutral to roll into the promised gas station. We made it into Tillamook with less than a gallon to spare. We decided to get over our stressful trek with a splurge at Roseanna's Cafe, right on the beach of the aptly named Oceanside (population 250). We got the last table by the window in this restaurant that looked like an upscale diner, and were rewarded with a beautiful Pacific Ocean sunset behind the three mammoth haystack rocks just off Oceanside's shore. The scenery was nearly bested by the food that we were served at Roseanna's. We started with a delicately prepared clam chowder and a shrimp cocktail with an excellent sauce that had a gentle bite of horseradish. For the main course, Heather ordered the Copper River salmon, which is an intense, red, flaky fish that bears no resemblance to its farmed Atlantic brethren. Copper River is up in Alaska, and the yearly harvest of its salmon has become a gastronomical marketing event on par with the arrival of the Nouveau Beaujolais. I went for the baked sea bass, which arrived in an earthenware dish covered in bay shrimp, and swimming in a sauce of sun-dried tomatoes, pesto and parmesan cheese. It was accompanied by a lot of perfectly-prepared asparagus (deep green with a nice crunch). I selected the second-most expensive wine on the list, which I chose because of its description and funky name. The Girardet Marechel Foch is an Oregon red wine that is spicy, full-bodied, with a cherry and blackberry taste. We found out the next day that it retails for around $17 a bottle, and Roseanna's marked it up an unusually reasonable $10. Heather overcame her propensity not to order dessert because of her inevitable disappointment with whatever sweet concoction was served to her. She was rewarded with a marionberry cobbler that was nearly dwarfed by vanilla ice cream. She loved it, we loved our meal, and the whole bill came to $80 -- and no sales tax. Our bargain trip came to an end that night as we struggled to find a motel that didn't charge a hundred dollars a night. These local owners seemed convinced that the city folk would pay dearly for an ocean view. We stayed at the dowdy and overpriced Terrimore Motel in nearby Netarts for $65. The room was stuffy, the bathroom tiny, and the walls thin enough for us to hear the couple next door snoring. We compensated for that by opening the window which afforded us the lovely white noise sounds of the Pacific surf crashing on the wide boulevard of a beach. That, and the sign on the room door describing what a warning siren sounded like before a tsunami hit were the most memorable points during our overnight stay. I picked up some delicious locally-baked bread for breakfast the next day, along with some renowned Tillamook sharp cheddar cheese. We loved the bread, but I decided that Kraft Cracker Barrel cheese had a more distinctive, sharper taste to it. That last culinary observation made, we headed north up the coast towards Cannon Beach, passing through some quaint, quiet seaside towns along the way. 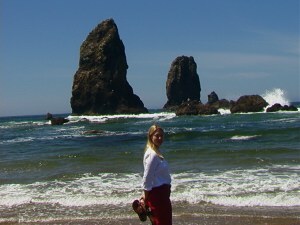 Cannon Beach was everything but quaint or quiet. Unlike Oceanside, this was a town that visitors had definitely discovered, with its easy highway connection to Portland. And thus what was probably as understated and natural as Oceanside further to the south, had been transformed into a tourist destination, the Carmel of the northwest. What once came naturally to these small towns now had to be fabricated and then preserved in a place like Cannon Beach. A multitude of hotels, bars and restaurants lined the streets of this "tourist quaint" town. Young families and groups of teenagers patrolled the sidewalks and beaches. A longtime Cannon Beach resident told us that property there might as well be sold by the square inch, it was that expensive. Happily, there was a reason for the town's attraction, and that was the beach. 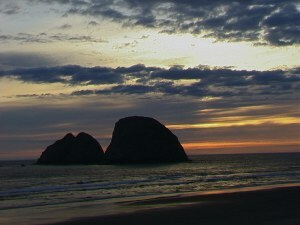 It seemed twice as broad as Paris's Champs Elysees, and its focus was its 235-foot tall haystack rock that stood an easy walk off shore. For June, the water already felt warm. It was low tide when we were there, increasing the appearance of immense sandy beach-space. The bright noon-day steamed the moisture off the quickly drying sand. 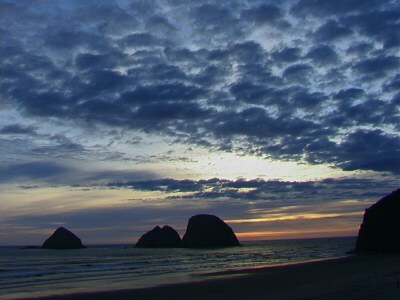 And whatever ill-will we had borne against the town of Cannon Beach was quickly dissipated by the beach itself. Since our trip was intended as a quick jaunt, we promised each other we would return, perhaps to camp in one of the nearby state parks. 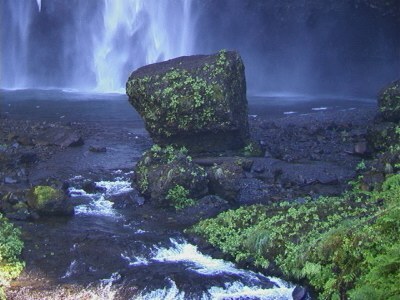 Oregon's beautiful scenery was almost enough to forget its other tourist attraction -- no sales tax!